Edraw offers you ready-made word competitive analysis templates which can be re-edited and used for free. Edraw can be used as an easy to use competitive analysis diagram maker where you can get professional looking competitive analysis templates. As it's fully integrated with Microsoft Word, you can save your competitive analysis diagram to MS Word format with a simple click. 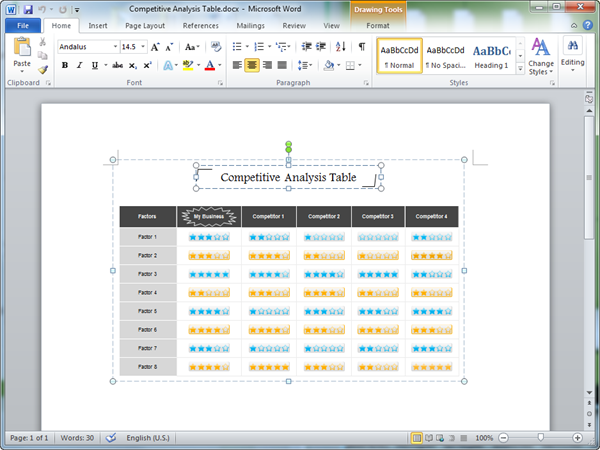 The competitive analysis chart in word can be still edited. Edraw has powerful charting and diagramming functions that makes it easy to create various kinds of competitive analysis diagrams. Besides, we have select some good-looking competitive analysis templates that you can use for free. Edraw professionally-designed competitive analysis templates and examples will help you finish your presentation quicker. Just choose one and customize it. You may like Competitive Analysis Templates for PDF. The template works in word versions from Word 2010 on. Download Edraw to Create More Competitive Analysis Templates for Word. Try Edraw Max FREE.